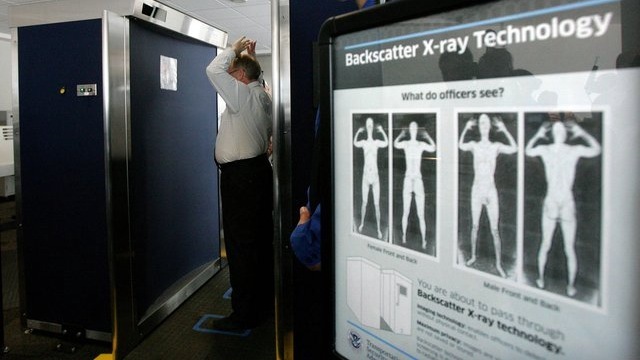 Recent “News” and media misinformation touting airport x-ray scanners “safety” is misleading! Policies that allow the traveling population to be subject to greater exposure of ionizing, non-diagnostic x-ray will lead to greater incidence of thyroid disease, and greater burden on the health care system of this country. Ultimately it also means more money out of your hands, and into the hands of the pharmaceutical giants, the insurance companies who will raise their rates again with the excuse of greater disease rates, and the manufacturers of these airport x-ray scanners. None of these entities care that your long-term health is at risk, proportionately with greater x-ray exposure. Do you remember the last time you got x-rays at the dentist? They used a “thyroid shield” as an addition to the lead apron, in an attempt to block any scatter radiation from reaching your thyroid gland in your neck. Scatter radiation is often labeled as “harmless,” yet they use a shield for this at the dentist’s office. Why? The thyroid is one of the most vulnerable tissues in your body. The effects of x-ray exposure are not immediately measurable. The wrong question to ask is if one scan has been shown to be “harmful.” There is no short-term way to measure the long-term effects. This common question only considers the short term consequences, which cannot be measured, and is therefore a foolish, misleading question. Every time this obnoxious question is asked, the wrong issue is addressed and the confused public continues to line up at the airport for a dose of ionizing scatter radiation. The real issue is the long term effects of large populations being exposed to non-diagnostic ionizing radiation, and the disaster it poses for our own health and our healthcare system. We are commencing this disaster right now, by this short-sighted and dangerous policy. Problems with the thyroid can lead to brain degeneration, leaky gut and irritable bowel syndrome, weakness, chronic fatigue, brain fog, hormonal imbalance, autoimmune disease, bone loss, environmental sensitivities, allergies, constipation… the list goes on! What’s just as bad, is that most doctors will not functionally address the thyroid and its associated problems, in a meaningful way, but instead will wait until blood tests show a clear hypothyroid profile. Thyroid problems may take a minimum of three years to be diagnosable. All the while your thyroid is being destroyed by autoimmune disease. Not good! Until a diagnosis finally comes, you would remain in thyroid limbo. Your health is at risk. We have to reject this type of security screening now, before it leads to the degeneration of our health, and its tremendous repercussions on the American healthcare system. Dr. Barry J. Lieberman, D.C.
– Rep. Ron Paul to TSA: Stop Irradiating Our Bodies and Fondling Our Children!